I was looking into this customer issue where they upgraded from Call manager 4.x to 7.x and almost all users on 7912 phone lost their speed dials. I checked the phones and CCMUSER page and found that the dials where there but they are not able to access it. Created a new Softkey template including “AbbrDial” at “off Hook” mode. Reset the phones and asked them to check. Customer came back saying they cannot see “AbbrDial” Softkey. All settings in Call manager were fine but for some reason they were not able to see the Abbreviated Dial Softkey. I checked the firmware for 7912 and it was CP7912080003SCCP070409A. 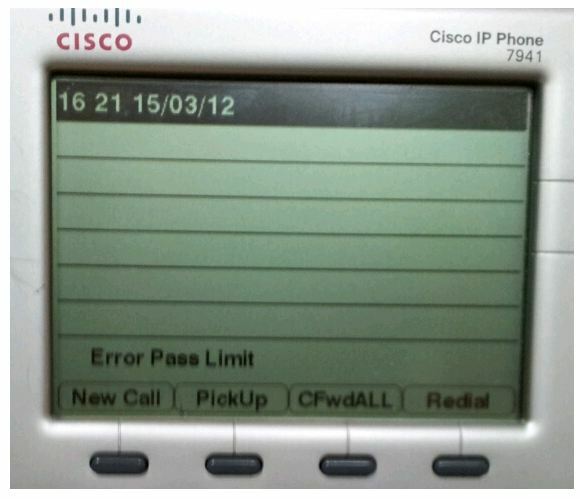 I decided to upgrade the firmware for 7912 to the latest one CP7912080004SCCP080108A. I loaded the new firmware, restarted TFTP, reset the phones and it all started working fine. Later I came to know that it’s a kind of a bug that if you upgrade from CCM 4.x to 7.x then your 7912 phones will have issues in AbbrDial Softkey. If you come across this issue, upgrade the firmware and you will be good. Interesting case today. I had a call from customer saying they had a power cut and when the power was restored all their phones went into ‘Registering’ status. I initially thought it could be a network issue from switches to CUCME gateway as the config was looking fine to me. I did a show ephone summary and found all of them in ‘Unregistered’ status. Nothing changed really, the config was all ok and these phones were all working fine few minutes before. So what has gone wrong? edit DN through Web: enabled. edit TIME through web: disabled. Did you guys see what was wrong? Somehow the telephony service went into shutdown state. I did a no shut on telephony service and they all start registering. For this particular issue I found no extension was assigned to it so I assigned an unassigned DN and the issue was resolved.